In this area of the Apparel Search fashion brand directory, you will find women's fashion brands from leading apparel companies and fashion designers. On this particular page, you will find information regarding women's clothing with the Jessica Simpson brand. You are welcome to utilize this section of our clothing guide to review Jessica Simpson news, Jessica Simpson blog posts, Jessica Simpson photos, and more. Please understand that you may run into a few photos or a tad of information that does not actually pertain to the women's Jessica Simpson fashion brand. Unfortunately, no search technology is absolutely perfect We will continue to do our best to bring you as much information about the women's Jessica Simpson fashion collection as possible. The Jessica Simpson Collection is a fashion line of clothing and other items for women and juniors. Besides clothing, the brand also includes handbags, sunglasses, accessories, jewellery, shoes and fragrances. The brand initially launched in 2006 as a shoe collaboration with Nine West co-founder Vince Camuto. Due to the success that followed, Simpson began adding on, which resulted in the brand's many different products. Jessica Ann Johnson is an American singer, actress and fashion designer. Simpson signed a recording contract with Columbia Records when she was sixteen, and released her debut studio album in 1999. The album sold over four million copies worldwide, and spawned the top three hit "I Wanna Love You Forever". Aside from her musical pursuits, she launched The Jessica Simpson Collection in 2005, a fashion line of clothing and other items. The brand has gone on to earn over $1 billion in revenue, and is regarded as one of the most successful celebrity founded brands ever. Learn more about the women's Jessica Simpson fashion brand. 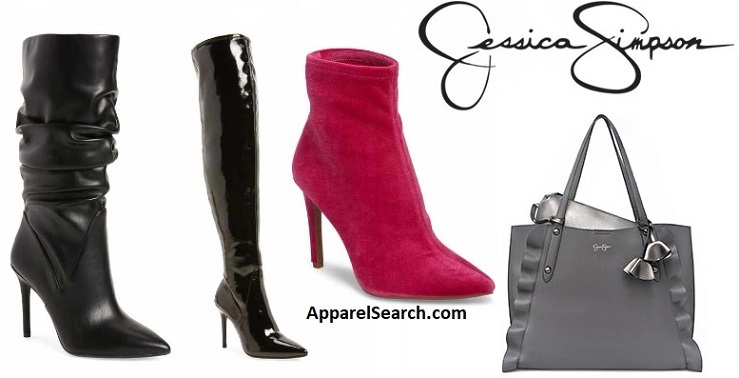 If you have changed your mind and do not wish to research the brand Jessica Simpson, you can use the search engine on this page to find another clothing label that may be of more interest. Apparel Search is a leading guide to fashion, style, clothing, glam and all things relevant to apparel. We hope that you find this Jessica Simpson page to be helpful.